This is normal as there aren't any Datanode daemon available for data replication. I've always been impressed by the stackoverflow and serverfault web sites. Granted forums have been around for a long time - however I love the user interaction provided by the folks behind Stack Exchange. A couple of months ago they created area51 to request new ideas that could use the same framework behind stackoverflow and serverfault. And again the user experience for handling these requests is great. In my opinion Stack Exchange provides an excellent user experience that fosters user contributions and collaboration - in-line with the values of the Ubuntu community. Now that we have an efficient process to start instances within UEC/EC2 and get them configured for their task by puppet we'll dive into improving the performance of the puppetmaster with Phusion Passenger. The default configuration used by puppetmasterd is based on webrick which doesn't really scale well. One popular choice to improve puppetmasterd performance is to use mod passenger from the libapache2-mod-passenger package. The configuration is based on the Puppet passenger documentation. It is available from the bzr branch as we'll use puppet to actually configure the instance running puppetmasterd. ip-10-195-93-129.ec2.internal:8140 10.195.94.224 - - [08/Apr/2010:00:40:06 +0000] "GET /production/certificate/7d6b61a7-3772-4c41-a23d-471b417d9c47 HTTP/1.1" 404 2178 "-" "-"
ip-10-195-93-129.ec2.internal:8140 10.195.94.224 - - [08/Apr/2010:00:40:08 +0000] "GET /production/certificate_request/7d6b61a7-3772-4c41-a23d-471b417d9c47 HTTP/1.1" 404 2178 "-" "-"
ip-10-195-93-129.ec2.internal:8140 10.195.94.224 - - [08/Apr/2010:00:40:08 +0000] "PUT /production/certificate_request/7d6b61a7-3772-4c41-a23d-471b417d9c47 HTTP/1.1" 200 2082 "-" "-"
ip-10-195-93-129.ec2.internal:8140 10.195.94.224 - - [08/Apr/2010:00:40:08 +0000] "GET /production/certificate/7d6b61a7-3772-4c41-a23d-471b417d9c47 HTTP/1.1" 404 2178 "-" "-"
ip-10-195-93-129.ec2.internal:8140 10.195.94.224 - - [08/Apr/2010:00:42:08 +0000] "GET /production/certificate/7d6b61a7-3772-4c41-a23d-471b417d9c47 HTTP/1.1" 200 2962 "-" "-"
ip-10-195-93-129.ec2.internal:8140 10.195.94.224 - - [08/Apr/2010:00:42:08 +0000] "GET /production/certificate_revocation_list/ca HTTP/1.1" 200 2450 "-" "-"
ip-10-195-93-129.ec2.internal:8140 10.195.94.224 - - [08/Apr/2010:00:42:09 +0000] "GET /production/catalog/7d6b61a7-3772-4c41-a23d-471b417d9c47?facts_format=b64_zlib_yaml&facts=eNp [....] HTTP/1.1" 200 2354 "-" "-"
I've just outlined how to configure mod passeenger to run puppetmasterd which is a much more efficient setup than using the default webrick server. Most of the configuration is detailed in the files available in the bzr branch. In a previous article I discussed how to set up an automated registration process for puppet instances. We'll now have a look at how we can tell these instances what they should be doing. Going back to the overall architecture the Cloud conductor is the component responsible for starting new instances. Of all the three components it's him that has the most knowledge about what an instance should be: it is the one responsible for starting a new instance after all. 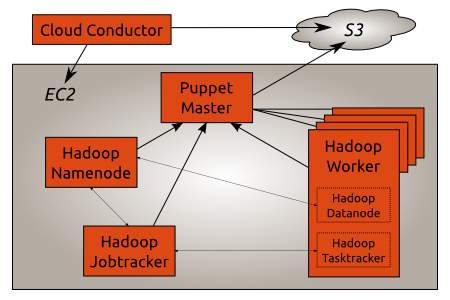 We'll use the puppet external node feature to connect the Cloud conductor with the puppetmaster. The external node script -node_classifier.py - will be responsible for telling which classes each instance is supposed to have. Whenever a puppet client connects to the master the node_classifier.py script is called with the certificate name. It is responsible for providing a description of the classes, environments and parameters for the client on its standard output in a yaml format. Given that the Cloud conductor creates a file with the certificate name for each instance it spawns we'll extend the start_instance.py script to store the node classification in the content of the file created in the S3 bucket. You may have noticed that instances started by start_instance.py don't have an ssh public key associated with them. So we're going to create a login-allowed class that will install the authorized key for the ubuntu user. We'll use the Ubuntu Lucid Beta2 image as the base image on which to build our Puppet infrastructure. Start an instance of the Lucid Beta2 AMI using an ssh key. Once it's running write down its public and private DNS addresses. The public DNS address will be used to setup the puppetmaster via ssh. The private DNS address will be used as the puppetmaster hostname given out to puppet clients. Note that the script is set to return 1 if the certificate name doesn't have a corresponding file in the S3 bucket. You may want to change the return code to 0 if you want to use the normal nodes definition. See the puppet external node documentation for more information. Note that you'll have to set the node_terminus to plain to avoid calling the node classifier script when configuring the puppetmaster itself. Otherwise the puppet run would fail since the puppetmaster certificate name (which defaults the to fqdn of the instance) doesn't have a corresponding file in the S3 bucket. It's time to update the Cloud conductor to provide the relevant node classification information whenever it starts a new instance. If you look at the start_instance.py script you'll notice that the ACL on the S3 bucket is 'public-read'. That means anyone can read the list of your nodes as well as the list of classes and other node classification information for each of them. You may wanna use S3 private url instead. We now have a puppet infrastructure where instances are started by a Cloud conductor in order to achieve a specific task. 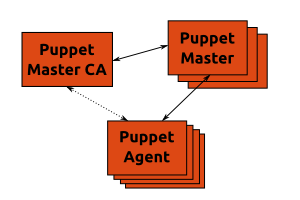 These instances automatically connect to the puppetmaster to get configured automatically for the task they've been created for. All of the instances configuration is stored in a reliable and scalable system: S3. With instances being created on demand our puppet infrastructure can grow quickly. The puppetmaster can easily be responsible for managing hundreds of instances. Next we'll have a look at how improving the performance of the puppetmaster.